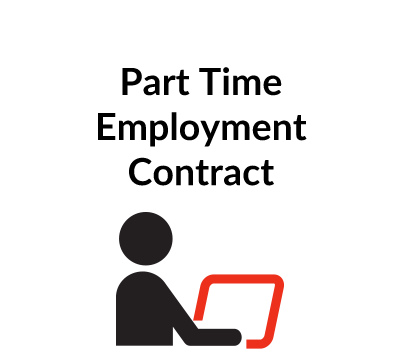 Who can use this fixed term employment contract? Anyone employing an individual for a fixed term of up to one year. What is this fixed term employment contract for? Use this contract when the offer of employment is for a short term, i.e. no longer than one year. After a year an employee’s rights change and become fundamentally the same as someone working on an established contract. What are the main issues for an employer when preparing a fixed term contract? The main point that you need to remember is that employees on a fixed term are protected from discrimination. The Fixed Term Workers (Prevention of Less Favourable Treatment) Regulations 2002 apply. So the contract needs to match those for full-time staff, insofar as relevant. This applies both with regard to salary, pension and benefits. What detailed terms do the fixed term employment contract contain? For more information see our Explanatory Notes below. Yes you can. ContractStore’s templates are prepared in MS Word and are easy to edit. You can fill in the details for each employee as well as alter the terms as appropriate. And you can use it for any fixed term employees in your business. 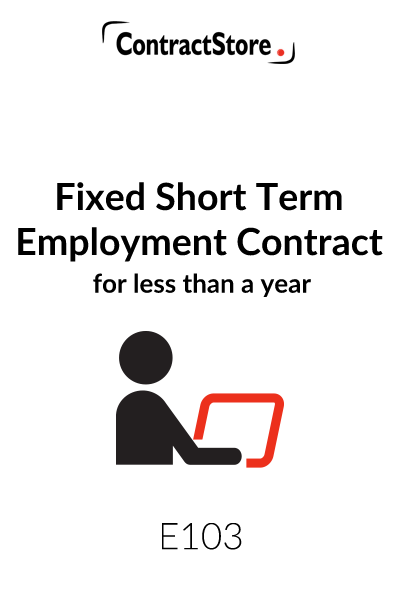 This is a fixed term employment contract for less than one year. The contract will terminate automatically on the end date, unless notice to terminate is served by either party at an earlier date in accordance with the contract. It is important to note that fixed term employees (not agency workers) are protected from being discriminated against by the Fixed Term Workers (Prevention of Less Favourable Treatment) Regulations 2002. In essence, fixed term workers have the right not to be treated less favourably than a comparable permanent employee in respect of pay and pensions, equal training opportunities and access to employment benefits. However, a less favourable term in a fixed term employee’s contract could be objectively justified if the overall package is no less favourable. For example, a comparable permanent employee may get employer pension contributions after 5 months service paid into a company pension scheme, but where a fixed term employee is on a 6 month contract, it will not be feasible (in cost or administration terms) to enrol him/her in the company pension scheme for one month only. In that scenario, the fixed term employee should be given financial compensation for the loss of one months pension benefit (e.g. the employer could make the same contribution into an existing private pension scheme). There are other obligations which employers of fixed term employees are subject to, such as the requirement to inform fixed term employees of internal vacancies. If a fixed term employee believes they have been discriminated against (i.e. treated less favourably than a comparable permanent employee), he/she will have the right to bring a claim in the employment tribunal. For further information on the rights of fixed term employees, please refer to www.direct.gov.uk. 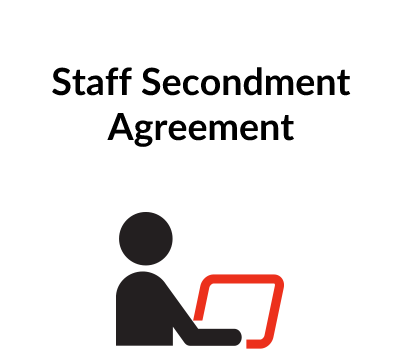 The contract can be issued to an employee after they have joined as long as it is not later than 12 weeks after the employment began. However it is best practice to ensure it is signed before employment commences. It is important that you review the contract to ensure that it is applicable to your business requirements. Guidance is given below as to which clauses you may wish to amend or review. 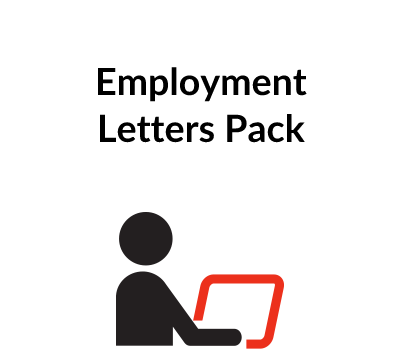 Page 1 contains a covering letter to send with the terms and conditions of employment. It contains instructions for the employee on what to do with the contract once they have read and understood its contents. It is important to ensure that all employees are treated equally and that no direct or indirect discrimination takes place by including clauses for some categories of staff and excluding them for others. 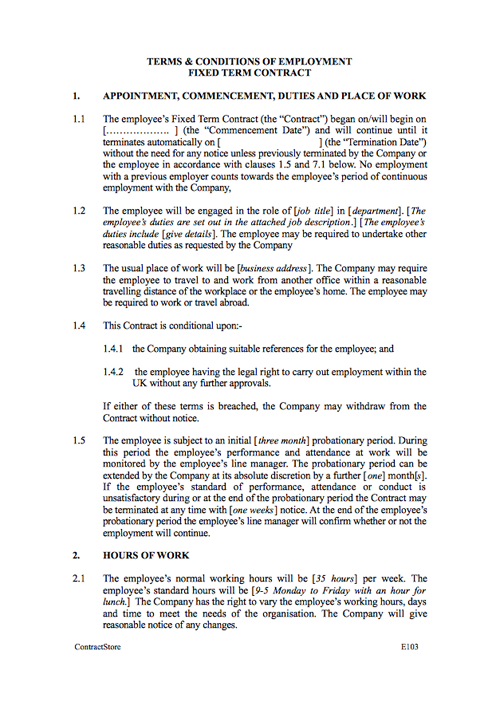 1.1 The employer needs to specify the beginning and end date of the contract. The contract can be terminated prior to the end date. Fixed tern contracts can also be terminated on the completion of a particular task, or the occurrence (or non-occurrence) of a specific event. It is essential to ensure that the contract is less than a year in length. If it is for a year or more, the employee will have the right not to be unfairly dismissed. 1.5 The length of the probationary period can be varied, and will depend upon the duration of the contract. During the probationary period the employee should receive objective feedback about his/her performance and the feedback should be documented. This should include the setting of specific targets for improvement if appropriate. If the probationary period is extended, it should not be extended for more than 6 months in total. At the end of the probationary period, a final decision should be made about the employee’s suitability for the role. Reasonable notice of changes to hours should be no less than 1 month, and it is important to bear in mind changes should not be so dramatic as to amount to a breach of the implied terms of trust and confidence. 4.1 All full time employees (including fixed term employees) are entitled to a statutory minimum of 28 days paid holiday each year, this is inclusive of all bank and public holidays. However, many employers will generally grant an additional entitlement to take off bank and public holidays. In any event, the amount of holiday entitlement granted should be equivalent to a comparable permanent employee. 5.2 Since April 2010, the old medical certificate issued by GPs has been replaced by the “fit note”. Most employers normally require one after 7 calendar days of sickness (i.e. 5 working days). 5.3 Many employers provide full pay for x number of days of illness each year. It is far better to specify e.g. 5 or 10 days of full pay, rather than provide for none and exercise your discretion on an ad-hoc basis as to whether you will provide full pay or not. This latter route could cause unfairness. Again, whatever you decide should be the same as for a comparable permanent employee. 6. See the note under “Legal Background”. As well as considering enrolment into any pension scheme, you should also consider whether there are any benefits attached to the scheme (e.g. life insurance). Again a fixed term employee should be given access to the same benefits as a comparable permanent employee. If that is not possible, then you will need to examine ways that the fixed term employee’s overall package is no less favourable (e.g. increase salary by a commensurate amount). 7. There is no requirement to give notice to an employee if the contract is due to expire on the date stated in 1.1. 8. It is advisable to have a confidentiality clause, which not only requires the employee to maintain confidentiality while working for the employer but also after the contract comes to an end. In addition, the clause requires an employee to return documents belonging to the company at the end of the contract.